Participants will earn their BSA Lifeguard certification by demonstrating their aquatic skills in swimming 800 meters, lifesaving, rowing, canoeing and first aid. The participants will also be trained in Safe Swim Defense and Safety Afloat. This unique outdoor course puts participants through a series of physical challenges that require them to climb, jump, balance, and use ropes, as well as to think through situations and develop solutions. This leadership challenge allows participants to deal with relationships and master their own fears and insecurities. Participants will be able to climb and rappel Camp Birch's climbing tower, instruction will revolve around the Mountaineering Ranger elective. Learn basic gun safety, rules and regulations by a certified shooting sports instructor. Camp Birch offers many opportunities to explore the Scenic Little Miami Trail. There is a limited number of mountain bikes available at camp or bring your own. Helmets are required at all times. 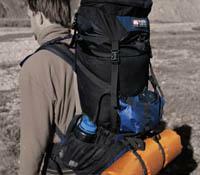 Learn proper backpacking skills needed for a safe and comfortable trek. Once learning the skills and equipment use, enjoy an overnight trek to Camp Birch's primitive area, Fallen Timbers. Team East trained Trainers will certify participants in the Leave No Trace principals. Ranger Quest is fortunate to have trainers trained by Team East.